Recently, Total Greek Yoghurt released 1000 Ways to Love Your Total on their website - 1000 new recipes and usage suggestions for Total Greek Yoghurt. As you may have seen from other recipes on my blog, I like to cook with yoghurt quite often, and as a vegetarian, it is a great food source. Yoghurt is a really healthy, versatile product which has lots of fantastic uses. Total Greek Yoghurt is the only authentic Greek Yoghurt sold in the UK. It is great to use in cooking as it is much thicker and more robust than greek-style yoghurt. 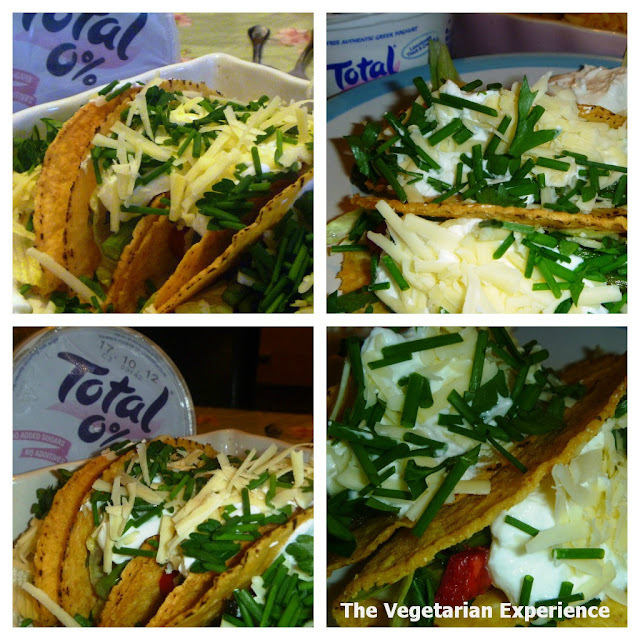 To sample one of the 1000 recipes on the website, Total sent us the ingredients to cook these Taco Shells with Asparagus and Chilli. We love mexican food and so the kids were really excited about having tacos. Previously, we have only ever had Taco's with veggie chilli and so we were eager to try our taco's with different ingredients. We really enjoyed eating the Taco's, although when I make them again i would probably leave out the chillis as myself and the kids didn't really like them raw. I would add some peppers and onions or spring onions to the recipe instead. I think that the yoghurt makes a fantastic substitute for the sour cream I would typically add to taco's and I actually preferred using it. The recipes featured on the Total website are now available in a brand new Facebook App, so that you can find inspiration for recipes whenever you need them, wherever you are. To celebrate the launch of the app, Total Greek Yoghurt are running a competition. Total Chef, Paul Merrett has put together a list of his essential kitchen equipment. The lucky winner will get his amazing wishlist of equipment including some fab cookware worth more than £800. Total have hidden 30 Total recipes on 30 different food blogs across the web. If you click on the badge below, you will find clues leading to ten of the hidden recipes. You then need to use the clues to search for the blogs which the recipes are featured on. Over the coming weeks, Total will also post additional clues to find the final twenty recipes. The more recipes you find, the more times your name is entered into the draw, and so the more chances you have to win. If you have landed on my blog through searching for Taco Shells with Asparagus and Chilli as part of the competition, congratulations, you have found the right blog!